When winter hits we want our homes to be cosy and heated well! There are so many different options for heating your home these days that you might be finding it difficult to choose the right heating system. That’s why we’ve taken the time to put together this helpful guide to choosing the right heating system for you. We want you to be equipped with all the information you need to make the best possible choice. In this guide we'll begin by giving you some questions to think about before you make a final decision on which heating system will suit you. By thinking about these questions, you'll be clearer on what you're searching for and will inevitably be happier with the system you choose! We'll then outline the different heating systems available, explain how each system works, and explain differences in safety and costs. Heating systems don't have to be expensive to run. If you talk to a SunRay Heating professional to help you select the most efficient and cost-effective option to suit your space and lifestyle, you'll find that the costs will be much more manageable than those you'd incur otherwise from choosing an inefficient unit unsuited to your space. No matter your lifestyle, the size of your home and whether you’ve got gas or electric connections available, we can help you find a heating option that will keep you cosy in winter without breaking the bank. If you have any questions about the heating systems listed here or want to discuss how we can help you further, feel free to contact us to chat to one of our friendly team! You can give us a call on (08) 8396 5617 or visit our website. Heating options for your home are endless, and what you choose will ultimately depend on your lifestyle, the layout of your house and your personal preferences. Before you start your search for the right heating system it might help you to have a think about what exactly you’ll be looking for. How much time do you spend in the rooms you’re planning to heat? Would you prefer an on-demand heating service (one that turns on and off with the touch of a button) rather than one that takes time to warm up? Do you and your family have a set routine or an unpredictable lifestyle? Do you and your family spend the majority of your time indoors or outdoors? Which part of your house is ideal for the installation of a heater? How powerful do you need your system to be? How cold do you get in winter? Would you prefer heating through your entire house or in only a few rooms? Would you prefer a localised source of heat (coming from one point) or heat spreading throughout your entire room or floor? What is your budget for unit purchase and installation? What is your budget for ongoing power bills? What product life are you looking for from your heating system? Does noise bother you? Are you looking for a completely silent heating system? The SunRay heating team can help you choose the right underfloor system for you based on your home and your lifestyle. 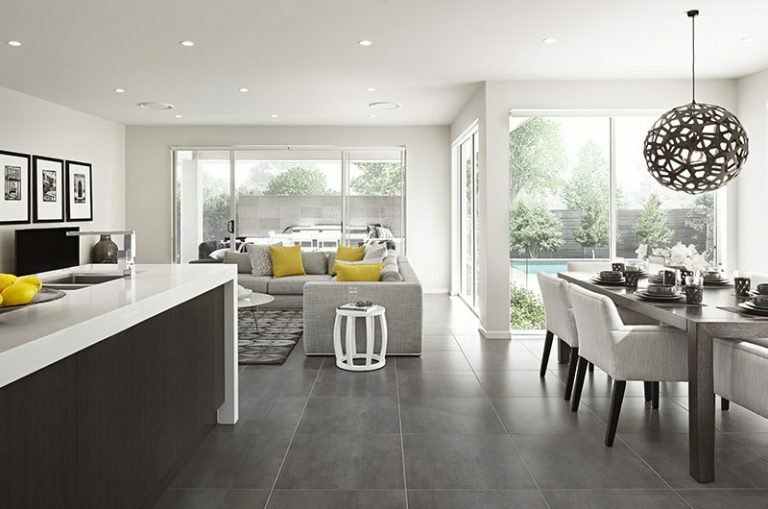 Underfloor heating is a modern heating solution that has become increasingly popular in Adelaide in recent years as the systems have become more affordable and efficient. An underfloor system allows for a stable temperate environment in your home year round, with radiant warmth in winter and refreshing cool relief in summer. If you get particularly cold in winter an underfloor heating system may be the solution for you! Underfloor systems provide an efficient way to heat your entire home and remove the nasty shock of cold floors on your feet on cold mornings. Underfloor heating systems are popular with people who live in slightly colder climates in Australia. They work extremely well in bathrooms and colder living areas, and can also be installed underneath carpeted areas and other flooring types. Uses thermostats and time switches to look after the heating system, so you can simply set and forget! ​Easy to install when building, extending or renovating, and no floor or wall space is lost. No pilot lights to re-light or wood to collect. Simple, convenient and effective! Your whole home is a constant temperature and can be controlled by a central thermostat and programmed to come on and off at the temperature you want. Underfloor heating comes in a variety of formats so there’s bound to be an option to suit your home. We’ve laid out the basics of our most popular systems below for you! Hydronic systems rely on water being heated and circulated through your home through underfloor pipes. 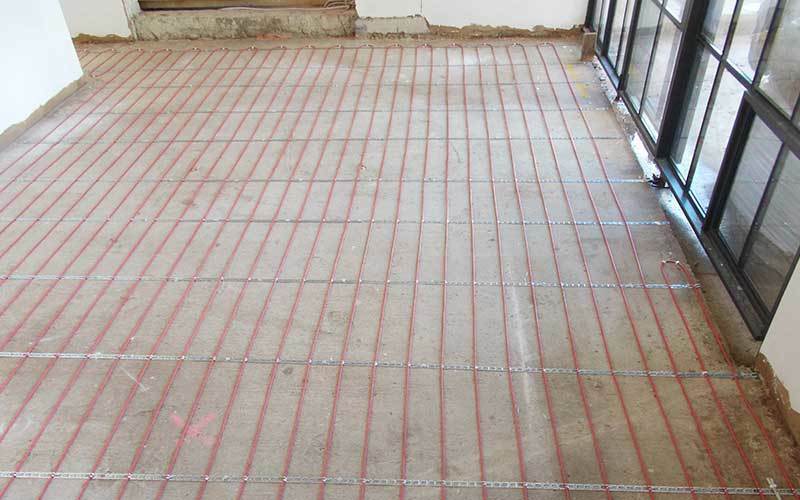 The underfloor pipes are laid in a pattern that allows the heat to be evenly distributed. The pipes are embedded in the floor, usually in a screed, slab, or beneath a timber floor. Traditional heating methods, such as forced air systems, produce convection currents around each room causing the unpleasant feeling of overheated upper levels, while our feet become cooled by the return air. The air moving across ceilings and other surfaces leads to high thermal losses and additional energy being consumed to make up for these losses. The water circulated through the pipes is mildly warm water. The water heat is then transferred to the surface of the slab, where it provides comfortable, gentle warmth to an entire room. A layer of thermal floor insulation can be placed beneath the pipework so that the heat radiates upwards. As the surface area of the heat emitter (ie. the floor) is much larger compared to wall heating units or radiators, the average water temperature necessary to provide heat for your home can be reduced. The heating process used for a hydronic underfloor system provides even, steady levels of thermal comfort throughout your entire home and is far less obtrusive than wall units. To cool your home, cooler water is circulated through the same underfloor pipework, resulting in an evenly cooled home. Electric underfloor heating systems work via heating wires being installed under the floor, which are then controllable through a thermostat. Depending on the underfloor heating system you choose, the wires can be connected to off peak or smart meters so you can take advantage of reduced electricity rates during off peak hours and save on expenses. The heat radiates from the wires into the floor, which spreads and emits warmth across the entire floor area. This means heat will be evenly distributed throughout your room, as opposed to a localised heating source which heats unevenly from one location. SunRay's in-slab 'off-peak' storage heating is suitable for one room or the whole home/building and can be used with just about any floor covering available such as carpet, timber, tiles or stone, as well as polished concrete floors. 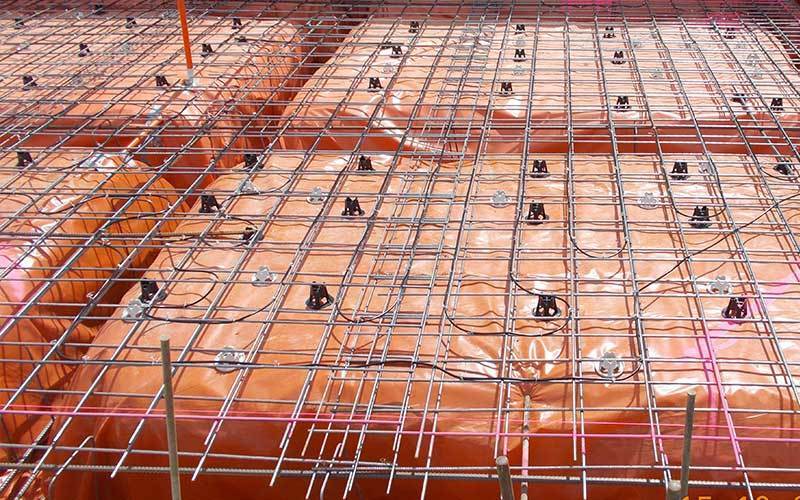 Insulated electric heating cables are clipped to the top mesh of the slab before the concrete is poured and to ensure that they are not damaged during installation, SunRay's expert staff monitor the concrete pour with specialised cable testing devices. Electrical energy is provided on the economic 'off-peak' tariff and stored in the floor which is then released steadily and continuously into the room to provide an even warmth over the entire floor throughout the whole day. SunRay's floor heating systems are economical because each zone/room has individual thermostat control with a remote floor sensor to enable you to set your desired temperature which allows for greater utilisation of energy. You will experience maximum comfort without draughts or dust and as there are no moving parts, the systems are free of maintenance. You don't lose any valuable floor or wall space. With a radiant floor heating system, the temperature of the floor surface is higher than that of the air. CSIRO tests have shown that radiant heating warms the whole body, whereas most other forms of heating only warm the upper body. If your feet are warm, you're warm all over! Traditional heating methods have noticeable convection currents around each room causing the unpleasant feeling of overheated upper levels – while our feet become cooled by the return air. The air moving across ceilings and other surfaces leads to high thermal losses and additional energy being consumed to replace these losses. With SunRay's floor heating, gentle warmth is everywhere and because the floor is slightly warmer than our heads, we feel more comfortable. As the heating cable is closer to the surface it has a quicker response time providing the warmth that you want, when and where you want it. It is the perfect choice when building or renovating and is the ideal way to heat bathrooms or living areas where tiles are being laid. Cables are embedded into a 20-25mm thick sand/cement screed bed (normally in bathrooms) or can simply be covered with tiler's adhesive. The screed/glue covering can be topped with tiles, marble, slate, parquet, carpet, laminates or can be stained or polished. The only visible part of the heating system is the electronic thermostat which ensures accurate and economical control which is sleek and unobtrusive. For maximum efficiency and energy savings, time switches can be installed to program the heating to come on before you get up in the morning, before you arrive home from work or whenever you want the room to be warm. SunRay's floor heating systems can be used anywhere in the house, regardless whether the floor is constructed with floorboards on joists or wood-laminates, floating timber floors or massive parquet on concrete. Wood is a natural material which contracts or expands depending on the temperature. This puts demands on a floor heating system to distribute the heat in a gentle and controlled way. This calls for a very precise heat control, and that is precisely what SunRay offers. ​Electronic thermostats with combination room sensor and floor sensing probes to ensure that the temperature in the floor construction always is in accordance with the tolerance level that the manufacturer of the floor surface has recommended. The floor will be nice and warm, and never too hot to risk any damages. Floor heating cables can be laid in the concrete slab for 'off peak' heated wooden floors, or on top of the slab in a glue/screed topping directly below the wooden floor. 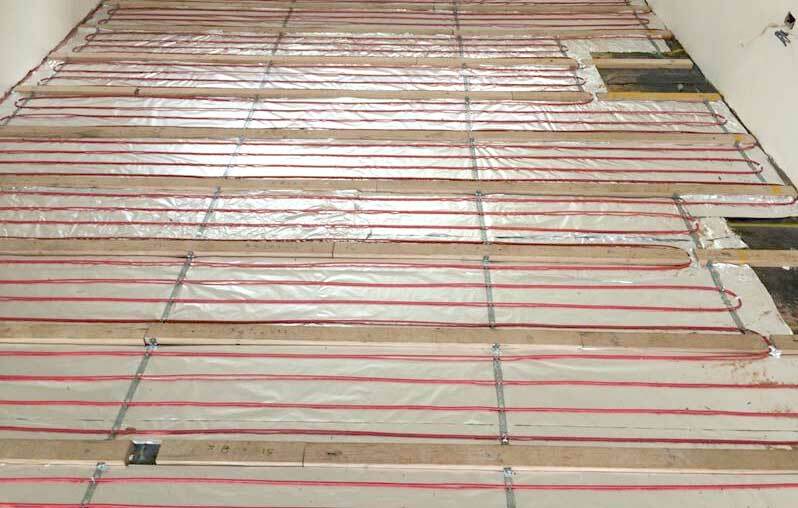 If timber floor boards on joists are used, the heating cables are installed on top of insulation approx. 50mm below the flooring between the timber joists and the floor boards are laid in the usual way. It is important that the floor is well insulated below to ensure the best heating comfort and most economical result. SunRay now offers the perfect solution for floating timber floor applications with the new Devicell™ Dry insulation plates! Contact us to find out more. SunRay's 'super-thin' devimat© radiant floor heating system is only 2.5mm thin and is ideal when existing floor heights must be maintained. It can be installed almost anywhere – even on top of existing tiled floors! No 'set down' is required as it is so thin it is installed directly into the tile adhesive with minimum increase in floor height. It is very practical and easy to install, delivering warmth on demand and efficiently controlled with an electronic thermostat and optional programmable timers. 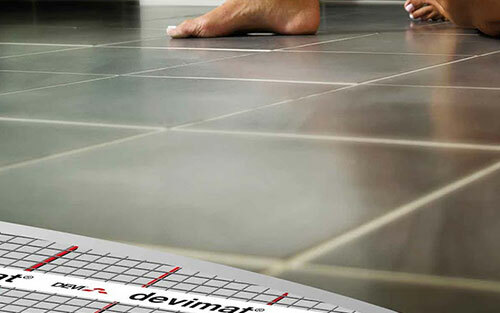 SunRay's Devimat Radiant Heating is especially suitable for bathrooms and kitchens or any other area where tiles are commonly used and warmth underfoot is desirable. The Devimats are ideal for existing domestic, industrial or commercial projects, especially when renovations are being carried out. Devimats are delivered in handy pre-manufactured rolls, 500mm wide and are suitable for all room sizes from 1m2 and up. Consisting of a self-adhesive teflon mat with the quality cable already fixed to the mat, installation is a breeze – all you need is a hot glue gun, a pair of scissors (for cutting the mat, not cable) and an electrician to connect the system! However for expert installation and peace of mind, SunRay provides professional installation for even the smallest bathroom! 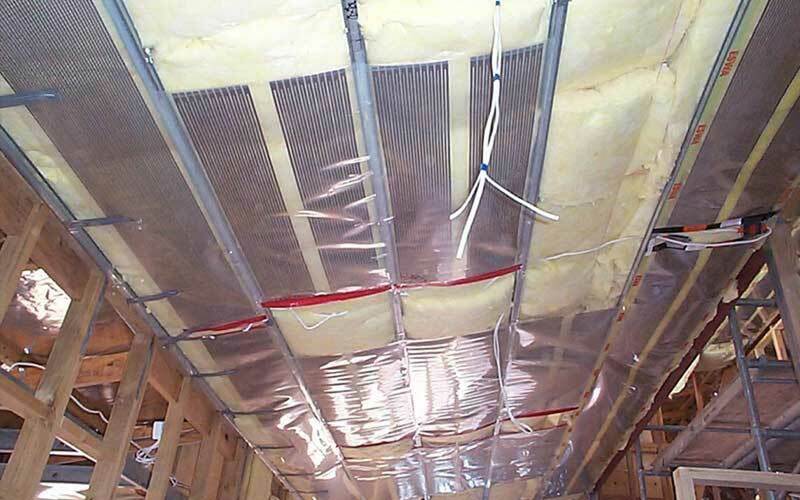 SunRay's electric radiant heat ceiling system consists of sheets of very thin, flexible heating elements which are placed above the ceiling and below a layer of insulation to reflect heat downwards. When the heating system is first turned on, the ceiling will start to warm up, with minimum heat loss upward (into the ceiling space) by the use of adequate ceiling insulation batts. You will start to feel warm because there are fewer cold surfaces in the room. The floor temperature will eventually become warmer than the air temperature, which will feel comfortable because it will be warmed by the 'warm' surfaces such as the ceiling, walls and floor. People in the room will feel warmth from all the surfaces, as well as the heat being radiated from the ceiling. It's just like having a thermostatically controlled sunroom. Electric radiant ceiling heating gives you both economy and comfort with each area individually controlled, providing flexibility at your fingertips with no maintenance. SunRay's Slimline Electric Radiant Panel Heaters achieve maximum beneficial heat output using minimum energy costs wherever they are installed. 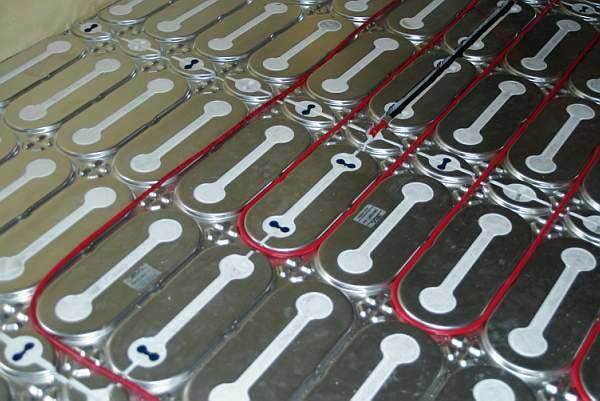 The Slimline panels owe their superior level of heat emission to their unique surface treatment of the panels, providing the highest efficiency of heat emission. 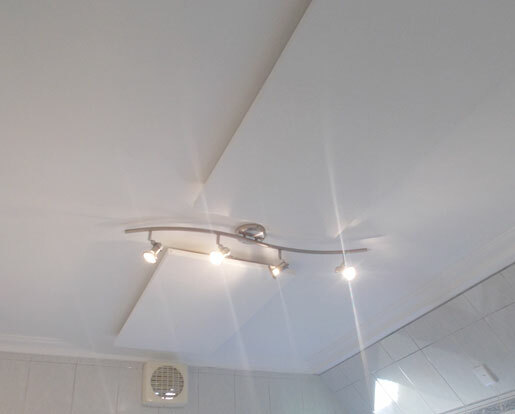 The panels fit neatly into new or existing suspended ceilings or can be surface mounted with brackets supplied. The Slimline Electric Radiant Panels are suitable for domestic and commercial applications, including bathrooms, kitchens, offices, school class rooms and hospitals. Due to the complicated installation process, underfloor systems are generally installed as part of a new build, however, with some help from the right professionals, you can also have an underfloor system installed quickly in your already established home. Underfloor heating systems are ideal for floors that don't contract or expand too much with temperature changes e.g. tiles, wood, and stone. 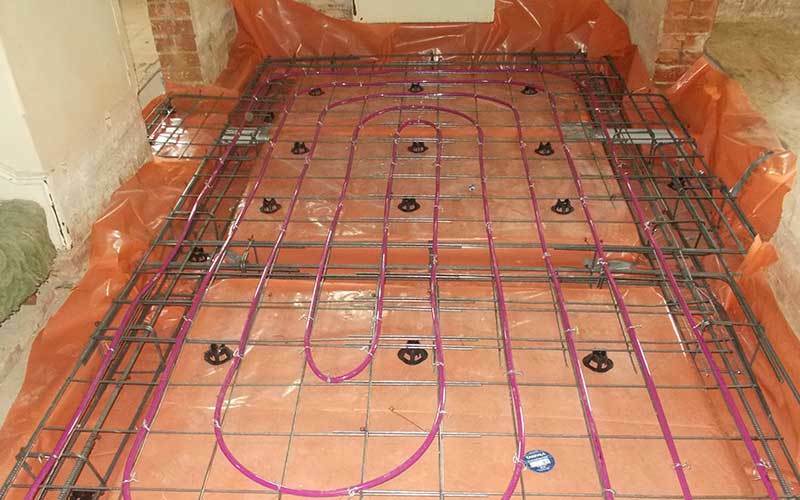 Hydronic heating systems are usually installed in new homes or extensions, as the hydronic pipes can be laid before the concrete slab is poured. There are a number of factors that influence the hydronic vs electric floor heating debate. These include but not limited to: heatable area, budget and gas/electricity availability which will determine your install and running costs. 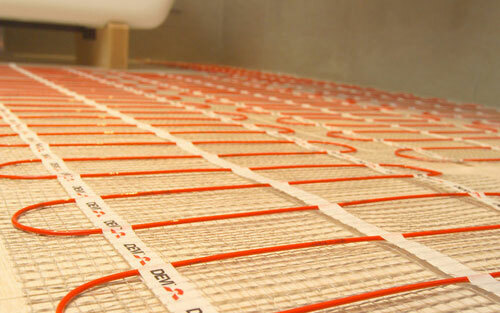 There are pros and cons with both hydronic and electric floor heating systems so speak to the professionals in radiant heating at SunRay Comfort Heating to get the right advice. Installing underfloor systems are a worthwhile investment if you're looking for a reliable, efficient and eco-friendly heating system to make your home cosy in winter! When considering a hydronic system, make sure you consider the costs of building work involved with increased slab thickness and extra reinforcing mesh. Hydronic heating is a cost-effective, efficient and eco-friendly heating option. With the introduction of high efficiency boilers and heat pumps, running costs have reduced in recent years! We do have interest free terms available! Can't wait to have your heating installed by SunRay but don’t want to pay for it up front or pay high interest rates on your current credit card? Purchase from us with a Lombard account and you won’t have to. You can start enjoying your heating from SunRay right now with our generous 6 or 12 months interest free terms. It's best to have electric ​floor heating systems installed by a professional rather than take safety risks installing one yourself. Certain types of underfloor heating systems are designed specifically for use with certain types of floor materials, so you'll need to double check the system you're intending to use suits your floor before you buy it— make sure to ask us at Sunray Heating if you have any doubts! The radiator panels of a hydronic system only reach mild temperatures and are safe to touch, so they’re perfect for homes with children. Hydronic systems are reliable and safe—the only concern you'll have is to ensure regular maintenance is undertaken to keep the unit running as intended. The options available for heating your home are endless! We hope this guide has assisted you in making a decision on the right option for you and your family. We encourage you to drop in to our store and chat with our friendly staff about any further questions you have or to take the next steps towards installation!